Pepper 7's Story . . .
Update 03/20/2014: "It was pure delight to see Pepper linger to sniff where he wanted and then jog to catch up to her." Pepper put away his winter parka as soon as milder days melted the snows of February. He was ready to hit the rail trails and woodland walks in his area and to show what a good boy he could be when off-leash. One sunny morning he had his chance. He and his foster mom hiked for over an hour on a big chunk of land with no vehicles and no people to be seen. It was an out and back hike, mild but steadily uphill going out and so, it was all downhill on the return. Pepper walked nicely on leash going out but really wanted to stop and sniff. There was so much of interest along the way so, on the return, his foster mom took off his leash and said "let's go." It was pure delight to see Pepper linger to sniff where he wanted and then jog to catch up to her. There was a smile on his face the whole way; his tail never stopped wagging. When they got to their Jeep, he stopped at the tailgate and accepted a lift in. Back home he slept soundly without snoring all afternoon! His overall display of energy was moderate on the trail but his expression of joy was huge. Pepper also developed some itchiness, some ear inflammation and seemingly some weight gain in late winter. To rule out an underlying problem, his thyroid activity was tested. When the results came back as normal, his vet felt certain he was experiencing some allergies. A treatment plan emerged, including a food change to a different protein, a daily OTC antihistamine, a fish oil supplement and weekly shampoos with a special cleanser. A modest amount of time and cost is involved which may bring him complete comfort over the long haul. With several weeks on the plan, Pepper is rarely scratching now and his ears are perfect……………..yahoooooo!! Still hoping to find his own family, Pepper would be a perfect match for another senior who likes to walk and understands that a little TLC goes a long way toward making life complete. If he sounds like the friend to share your senior years, please ask about Pepper. Update 01/27/2014: "He's so very adaptable to the changes that come his way." Pepper continues to be a great house guest in his foster home. He’s so very adaptable to the changes that come his way. A few days before Christmas, a second foster needed safe haven in Pepper’s home for 2 weeks, until transport to another family could be arranged. Pepper was unruffled with the newcomer. As with all dogs he meets, Pepper let Chudleigh know in appropriate doggie fashion that he was not a playful gent. With that message conveyed, the two got along as if they’d been buddies for years. A schedule change came along in December too. Until then, Pepper’s foster family had always gotten home mid-day to give all the dogs a potty break and round of treats before returning to work. Eliminating “lunch at home” led to some long days and one or two accidents in his crate but, after a few days, Pepper was again keeping a dry crate and for the length of time that is normal for many dogs with working families. 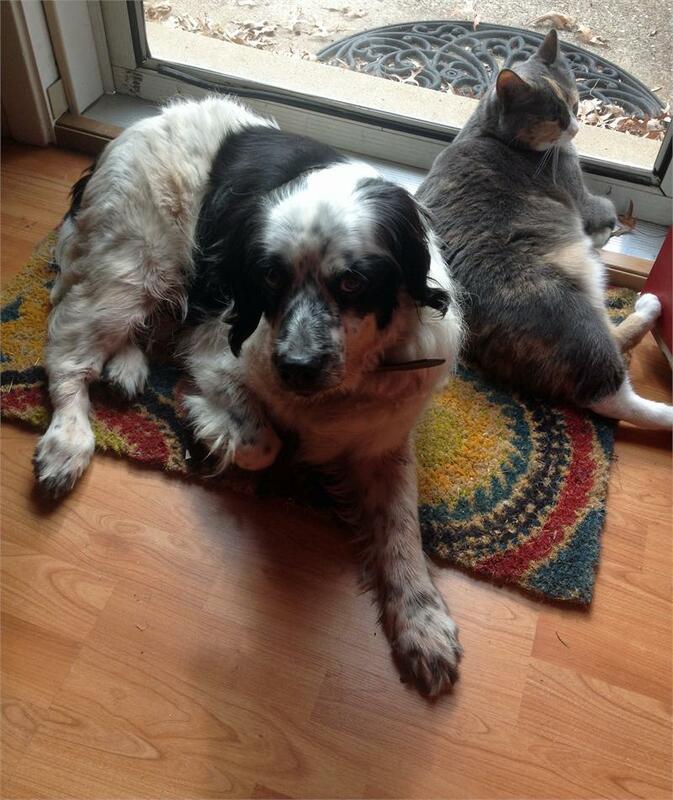 With his heartworm treatment behind him, Pepper got to step up his exercise without worry. He’s an accomplished walker on leash, so eager to go, and a steady pace setter. It doesn’t matter what the weather is doing or where the walk is happening. The quiet of the town park in late afternoons or the busyness of the strip mall sidewalks after dark are equally fine with Pepper. He typically gets a half hour walk in several days a week and troops along at about 2-2 1/2 mph. If someone stops to say “hi”, he’s friendly and accepting of attention but he isn’t necessarily distracted by passersby. He just enjoys getting his exercise! Pepper has adapted to this winter’s unusually wicked weather too. He is amazingly eager to go out to do his duty, whether it’s 20 degrees or -5. He indulges his foster mom who asks him to wear a puffy pink parka when it’s really cold. 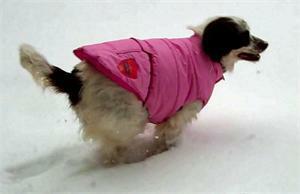 Yes, pink……..the only available color in his size. He’s very cooperative when putting it on. Whether it really keeps him warmer is uncertain but he looks ready for the ski slopes in it! Six inches of snow may slow Pepper a bit but it certainly doesn’t stop him from enjoying an outing. At day’s end, Pepper sleeps deeply. His snoring makes his family chuckle. He will accept a boost onto the people bed to share the warmth with the rest of his family but more often opts for a very thick bed of his own on the floor. Pepper likes attention but doesn’t demand it from people. He’s very even tempered and a positive thinker. Living with him is easy. Loving him is too. 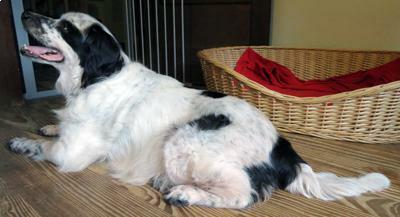 He could transition to many homes with ease and quickly become a treasured companion for a moderately active person. He does like to walk and spend time outdoors. He’s a low key sweetheart and ready for a family of his own. If you have a soft spot for seniors, please consider meeting Pepper. One walk with him and he’ll capture your heart. 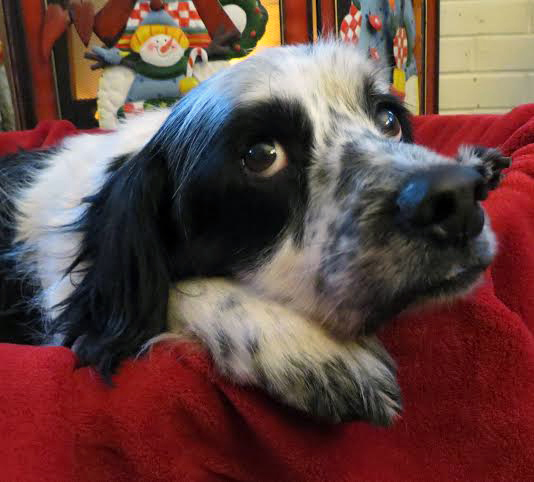 Update 12/15/2013: "He's hoping for the most enduring gift of all...........a Springer-loving family who has a seasoned companion on their own wish list." Pepper has been such a good boy this year. There’s no doubt about Santa finding him during his round-the-world flight. Not one to miss opportunity though, Pepper introduced himself when crossing paths with the big guy while shopping recently. The classic pictures were taken as the two sat visiting together, but the sweetest moment came when Santa knelt down; that was when Pepper beamed! 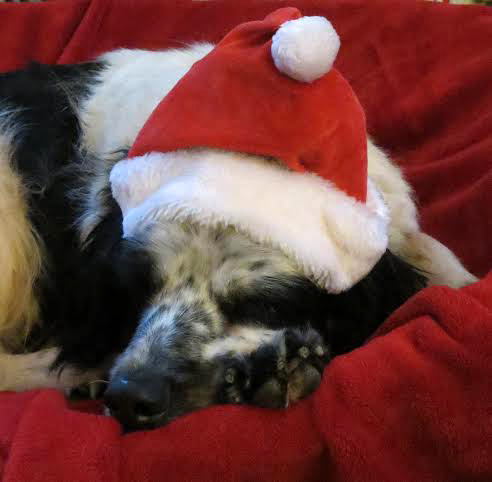 What Pepper may have whispered to Santa remains between the two of them, but a visit to the vet this week delivered part of what he surely had been hoping for……….a “negative” heartworm test and a much needed dental. The test result was not a surprise but brought a sigh of relief to those following his treatment. The dental included removal of 4 incisors worn to the roots and restoration of a snaggletooth canine. 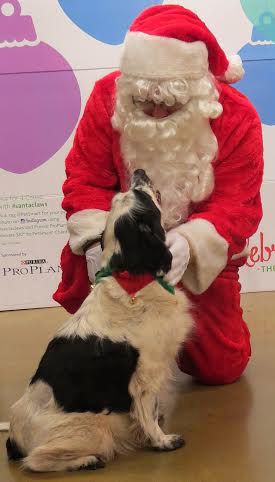 Softened kibble is Pepper’s bill of fare for now but, by Christmas, he’ll be ready to snarf up his favorite treats. Update 12/08/2013: "Over the week, he even found the companionship of one to be quite warm, especially when the kitty was willing to share choice sunning space at the front door with him. Good dog! Good kitty!!" Not all kitties put out the welcome mat for canine house guests, and, not every MAESSR dog is destined to be well-mannered in a home that includes cats. Fortunately, this fall when Pepper was introduced to the MAESSR family he was to spend a week with, the kitties in the home were cool upon meeting him and he, in turn, was well-mannered and respectful of their hospitality. Over the week, he even found the companionship of one to be quite warm, especially when the kitty was willing to share choice sunning space at the front door with him. Good dog! Good kitty!! While in his vacation home, Pepper was an “only” dog and without a fenced yard so his adaptable nature served him well. He walked daily with his foster family to meet modest exercise needs and did his duty on leash. On Halloween night when the doorbell began ringing, he was rather excited by the unusual arrivals, but by mid-evening, he had it all figured out and relaxed near the door as his foster mom continued to greet costumed visitors. Back in his original foster home, this sweetie has continued to grow into opportunity. With the arrival of winter’s first snows, he was offered space to snuggle with the rest of his family at night on the “high” bed. The first night this happened, Pepper seemed a little unsure but accepted a boost up. Before morning he was back on his own bed on the floor. The next night he accepted a boost up when invited and stayed the night. Since then, he’s at the bedside and expectant each night. How quickly he’s come to appreciate this comfort! Pepper’s a real cutie and an easy keeper. Outdoors he’s keenly tuned to his surroundings and regularly alerts to deer and the neighbor’s horses. Inside he rarely barks but will join in if the rest of the pack stirs. He’s largely undemanding of attention but is very accepting of all that comes his way. He’s tickled to settle at one’s side on the couch for an evening, or, he’ll settle on a dog bed………..just so he gets to be close to his people. For Pepper, life is about companionship. He’ll visit the vet soon to confirm that his heartworms are all gone and to have a dental done. Then, he’ll be ready for new companions and new opportunities. Pepper’s been a very good boy this year and knows Santa will find him in his foster home if he’s there, but what he’s really hoping for can’t be wrapped and dropped down a chimney. He’s almost ready for a family that values a dog as a companion, above all else. If that’s you, please let the foster home coordinators know. Pepper can’t be dropped down a chimney either but there’s a chance he could arrive by Christmas! Update 10/24/2013: "He was prancing when his foster mom picked him up and not just to go home; he seemed to have thrived in the busyness of the hospital scene." Mr. Pepper is cruising toward being heartworm-free. Recently he spent 2 days with his vet so the last 2 injections of a critical medication could be given under watchful eyes. There were no complications and he came home on one last course of a short-term med to further protect him as the last of the wicked worms die off. In December he’ll be retested and is expected to be negative. Treating for heartworms is certainly a lengthy process and not without risk but, for Pepper and dogs like him, it can be life-saving. While at the vet’s office, this cheerful gent had time to flirt with the office staff. They were quite amused by him! He was prancing when his foster mom picked him up and not just to go home; he seemed to have thrived in the busyness of the hospital scene. This was a sharp contrast with early visits when a muzzle was appropriate to safely examine him and a warning sign was placed on his cage so all would know he could be disagreeable. It’s wonderful to see Pepper’s turnaround! He’ll soon be visiting with another foster family while his current family is out-of-town. He’ll be an “only dog” there and will enjoy lots of attention. Check back for news on his upcoming adventure………J). With improved skin, there had been a gap in Pepper’s bath regimen. That said, as the time for visiting the vet approached for further heartworm treatment, he decided he needed to freshen up and have his nails done as well. He’s always been good for a bath, but this time he stood ever so quietly while his nails were trimmed…..no muzzle required. He earned an extra treat that evening for such improvement over his first trimmings. Good boy, Pepper! Pepper spent a night and the following day in the hospital so he could be monitored closely when the first injection in his heartworm treatment was given. With no adverse reactions, he came home a happy boy and resumed eating his healthy snacks. He’s on a fresh carrot kick right now and also likes frozen blueberries a lot! A few days later, he began short leashed walks around his yard. Pepper’s always ready go out to do some sniffing around; he’s always ready to come back in too and will settle on anything soft where ever his family is for the evening. If the rest of his treatment continues to progress smoothly, Pepper should be ready for an adopting family by year’s end. He may not fit in a stocking but he would look quite festive if snuggled under someone’s Christmas tree! Update 08/26/2013: "Zucchini, summer squash and cucumbers are all to his liking and he will sit eagerly awaiting his fresh snacks." Mr. Pepper’s heartworm treatment continues without a wrinkle. He’s had no allergic reactions to the meds he’s taken and is on schedule to receive a critical injection in about 2 weeks. Fingers crossed that will be a non-event too! He has become a bit itchy since one of his meds was phased out, so medicated baths will resume but not with the earlier frequency. With gardens coming in, he’s added a few new treats to his diet. Zucchini, summer squash and cucumbers are all to his liking and he will sit eagerly awaiting his fresh snacks. His appetite is great, he has good energy for leashed walks and his good cheer remains constant. As do most dogs, Pepper loves his comforts. When a week of really hot weather set in and the box fan was set out on the floor, he immediately claimed the spot right in front of it. When cooler weather returned, he could be found stretched out in the center of a big dog bed meant for two! Until he’s noticed, he delights in settling on the couch, but willingly will “off” when asked twice. And when his family is away from home, he trots right into his crate where a thick bed awaits. Pepper has become a self-appointed referee when the other dogs in his home begin wrestling. He will bark at them, wrinkle up his nose in a snarl and step right into the mix if necessary to send his buddies back to their corners. No one takes offense with his intervention and once he’s accomplished it, he retires to his mom’s feet. And, this happens every evening! He is a people boy and seems quite content to be wherever his foster mom is. If she lets him out and Pepper thinks she’s forgotten him, he barks to beckon her. It's a one-beat bark, repeated about every 5 seconds until she shows up. He can and will bark more at passing cars and the other dogs but, if he wants his foster mom’s attention, he's quite low key about it..........much appreciated! 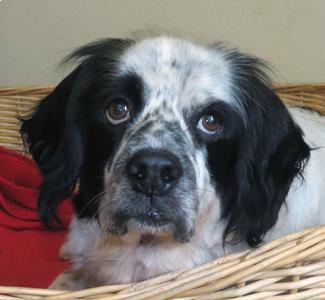 Pepper is a pleasure to have as a house guest and will make someone a charming little companion in due season. Glad he's a MAESSR boy! Update 07/25/2013: "He’s receiving a fairly complex regimen of meds for his heartworm disease that are given at home for several months." It’s easy to forget that Pepper has heartworm disease. He’s showing no symptoms, yet when tested a second time through an outside lab, he was positive again. This prompted bloodwork and xrays, both of which looked good, and cleared the way for treatment to begin. He’s receiving a fairly complex regimen of meds that are given at home for several months. He has his own pill box to keep up! He’ll also visit the vet for critical injections at precise intervals along the way. So far, he has done well with no complications. A little heavy breathing has been the only sign that anything is amiss for this boy………..a good start on what will be a long journey to good health! Pepper’s skin and ears are looking so much better than when he arrived. He’s itch-free and down to one ear cleaning a week. His toe nails are a good length now, and, there’s a noticeable spring in his step when he prances through the house. He’s even begun asking the resident dogs to play……………..a clear sign he’s feeling better! Unfortunately, play sessions for Pepper are prohibited due to the heartworms, but it’s great to see him want to mix it up. Original: "Most of Pepper’s issues are short-term, treatable and already much improved. Unfortunately, Pepper’s long-term and tough issue is heartworm disease." Pepper’s foster mom has no doubt that he was much loved and treated well by his owner during their many years together. Unfortunately, his care had been neglected of late as his owner’s battle with Alzheimer's progressed. When adult children of his owner stepped in to help, asking for MAESSR’s assistance with Pepper led to his surrender. He’s adapted well to his move and is making progress daily on his own issues. Most of Pepper’s issues are short-term, treatable and already much improved. He arrived flea-free but his skin was inflamed from a recent infestation. Medicated baths and an over-the-counter medication have relieved most of the itching and the color of his skin is returning to normal. His scratching has almost ceased. 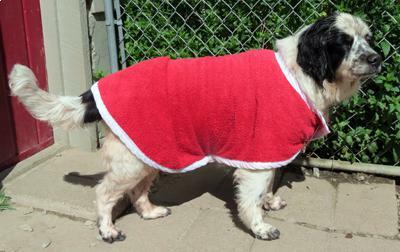 He steps right into the shower for his spa treatment and strides out in his red bathrobe. This is a hoot to see happen every other day! His waxy ears and long nails get daily attention right now but, once corrected, should require only normal care. This is the good news. 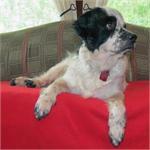 Unfortunately, Pepper’s long-term and tough issue is heartworm disease. Records arriving with him show he has been HW+ for some time. He also tested positive on an in-house screening at his vet check since becoming a MAESSR boy. Further diagnostics are underway to re-affirm the diagnosis and to determine the best treatment option for him. At this point he doesn’t cough, get easily winded, or show outward signs of this dreaded illness. He’s comfortable. Once the heartworm disease is addressed, Pepper would benefit from a dental, and, early-stage cataracts will need to be monitored too. This jovial gent has picked up the household routine easily. He has been accident-free with run-of-the-house when his family is home. 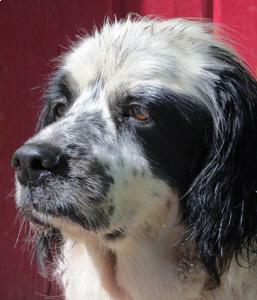 When his people are away, he is crated alongside the resident Springers. He dines there and is often found snoozing in his crate when the door is left open. He gets along well with the 2 resident dogs, though he let them know in appropriate doggie fashion, early on, that he had no interest in playing with them. With the arrival of a second foster a few days ago, Pepper let that dog know, again in good form, that he didn’t appreciate the rambunctious youngster in his face. Pepper strolls around the fenced yard with the rest of the pack but really prefers to be indoors. In fact, the only time his family has heard him bark is when he wants to come in……..and he’s quite clear about that! At night he sleeps on a thick doggie bed in the bedroom with the rest of his family. Hence, they all know he snores….. :)). Pepper was quite a hand-full during his initial vet visit and his first sessions on the grooming table. He was not mean-spirited, but he was clearly uncomfortable with the necessary handling. Each day of working with him has brought him greater ease. He’s a pleasure to groom at home now and will surely view the vet in a more favorable light the next time they visit! Until his next news, please keep Pepper in your best thoughts. He’s a good boy…………..